Jalapeno poppers, stuffed with cream cheese, hand-breaded and deep-fried to a golden brown. Six large shrimp grilled or deep fried. Colossal onion rings, dipped in our special batter and deep-fried. Smoked first, then fried. Dipped in hot, medium, mild or BBQ sauce. Tender strips of breaded chicken breast, deep fried and served with your choice of dipping sauce. Delicious tortilla chips served with homemade salsa. Lightly breaded and fried, served with your choice of dipping sauce. Creamy melted cheese stuffed in a flour tortilla with your choice of BBQ meat. All salads come with choice of dressing: House, Bleu Cheese, Thousand Island, French, Italian, Honey Mustard, Caesar, Vinaigrette or Oil & Vinegar. Choice of beef, pork, chicken, turkey or mixed (beef & ham), hard boiled egg, cheese, tomatoes, peppers and onions. Sliced chicken breast with choice of Italian, savory or mesquite seasoning over romaine lettuce, croutons and Caesar dressing. Mixed greens topped with fresh tomatoes and onions. Classic pork, beef and chicken stew with a vegetable tomato base. Choice of Hamburger Patty, Smoked Turkey, Pork, Chicken or Beef with applesauce, cottage cheese and tomatoes. Bacon, cheddar jack cheese and Kay's famous BBQ sauce. Smothered with crispy bacon, sauteed mushrooms and Swiss cheese. Fork Tender - Pure Eatin' Pleasure Kay's Bar-B-Que Ribs! All of our ribs are smoked for hours throughout the day to ensure the best quality and freshness. Served with choice of two sides. Choice of bread by request. Dry rubbed with Kay's secret spices and slowly smoked throughout the day to maintain the finest quality. Kay's mouth-watering, fall off the bone tender Baby Back Ribs and St. Louis Ribs. One pound of our St. Louis ribs dipped into our special basting sauce and smoked for hours throughout the day. A delicious mix of BBQ chicken, smoked pork, turkey, beef and ribs served with corn on the cob, Kay's famous BBQ beans, choice of potato, cole slaw and garlic bread. 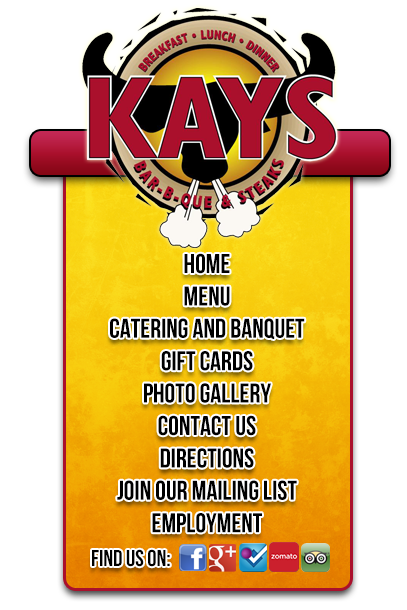 All of Kay's meats are sliced to order to keep its freshness. Huge platter of juicy BBQ chicken, pork, beef, smoked turkey and spare ribs. Lightly spiced pulled pork seasoned to perfection and slowly smoked for tenderness and flavor. Award winning St. Louis ribs and tender chicken. Two breasts grilled to order with a choice of savory, Italian or mesquite seasoning. Half chicken slowly smoked for hours and smothered with Kay's secret BBQ sauce. All steak selections are served with two slices of fresh garlic bread and choice of two sides. The most flavorful steak we offer! Cut to order and grilled to your liking. America's favorite steak! Cut to order and grilled to your liking. Cut to order and grilled to your liking. Doesn't get better than this! 8 oz. patty topped with our grilled onions. Lightly breaded tender steak fried golden brown and smothered with Kay's homemade country style gravy. New York strip or ribeye steak cooked to your liking with (1) fried fish or (5) fried shrimp. All seafood selections are served with hushpuppies and choice of two sides. Nine large shrimp grilled or deep fried. Fish fillets lightly hand breaded and fried crispy. Three farm raised catfish (SWAI) fillets, hand breaded and fried crispy. Delicious Slow And Low Smoked Barbecue, Basted In Our Secret Sauce And Served With The Best Homemade Barbecue Sauce Ever!!! All Caterings Come With: Three Sides, Bread & Butter, Paper Products And Barbecue Sauce. Rolls Included.